Are you interested in a Branson vacation? Branson Missouri is centrally located in the Midwest. If you live in Kansas City, Missouri, it is just a short three hour drive, about four hours on I-44 from St. Louis. four and a half hours from Topeka, five hours from Oklahoma City, OK, and three and a half hours from Little Rock, Arkansas. One visitors guide advertises the music shows that are everywhere in Branson. At any given time there are over 55-65 music variety shows for every age and taste. For a unique amusement park, Silver Dollar City, an 1880’s pioneer village theme park features rides, crafts, family attractions and special festivals. Inspired by Harold Bell Wright’s novel, The Shepherd of the Hills outdoor theater and homestead is another must see attraction. 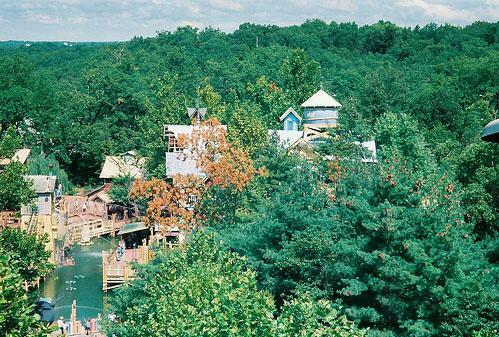 White Water is Branson’s only water park and is popular with children and teenagers. Another Visitors Guide highlights the Table Rock Lake area. Boating, fishing, swimming, camping, hiking are all available in the Table Rock Lake State Park adjacent to Branson. The Henning State Forest, the James River, the Finley River and the Buffalo river all offer kayaking and canoeing. The beauty of the lakes and forests is a hidden part of a Branson Vacation. If some of Branson seems to commercialized, one can always escape to the beauty of nature. Every kind of shopping experience is available in Branson. Several outlet malls are available for the bargain shopper and a wonderful upscale shopping, dining and entertainment area is in the new Branson Landing on the Taneycomo River. A spectacular fountain display synchronized with light, music, sound and fire on the riverfront. A secret of Branson is Mel’s Hard Luck Diner. The waitresses and waiters professionally sing in between serving the customers. These singers perform in shows around Branson and one or two have been featured on American Idol. For the price of a cheap meal in a 50’s diner, one can enjoy Branson’s best singers. Don’t miss this insider’s secret. A Branson vacation is a unique experience for people of all ages. It is great for reunions, family gatherings, or a romantic getaway for couples. It is generally considered a low-cost getaway destination and ideal for country music fans as well as for families with middle-of-America values who are interested in wholesome entertainment. A Branson vacation is unlike any other, once you’ve been a visitors guide in the U.S. for over 50 years.